Don’t you want an easy way to keep track of your activity and health? A fitness watch is a great way to monitor your activity and health. You can think of it as an electronic finger on your pulse that accurately measures your heartbeat, steps, vitals and position. Today’s fitness watches are bundled with features that make health and workout monitoring easier. Most of them can be synched with our iPhones for better data analysis. Finding the best fitness watch for iPhone need not be a daunting task. If this is your first time buying a fitness tracker for your iPhone, the number of products out there can be staggering. There are simply too many manufacturers, models and features that you need to consider. If this is not a new experience for you, you want to get the best fitness watch for your iOS device that is worth your money and loaded with great features. It’s a good thing that we are here to help! In this article, we are going to tackle some of the best features when choosing a fitness watch that you can use with your iPhone. Down the line, we will also highlight a few of the best fitness watches which can help you jumpstart your shopping quest. Let’s get to it! If you are looking for a fitness tracker, one of the best ways to find out which fitness watch is best for your lifestyle is by learning about some of the most important features that can help you get the most of your workout. Some people like hikers and joggers are happy with fitness trackers that come with pedometers or a GPS. Others prefer more features like calorie intake and sleep quality that can help them analyze their health and data better. If you’re not sure what features you need, here are some examples off fitness tracker technology that you need to consider when buying. People who wear conventional watches are used to battery life that lasts for years. Some watches are even auto-winding so you don’t need to think about battery life at all. Fitness watches are different because they need to be charged so that they will work properly. 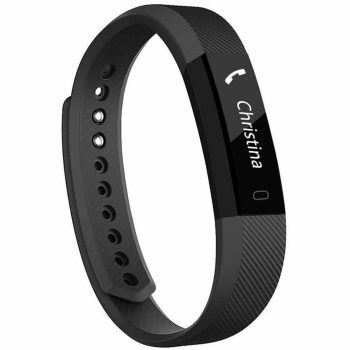 Some fitness trackers can last up to a week, others need to be charged daily. Consider your lifestyle. If you’re busy perhaps a fitness watch that lasts a long time is more ideal compared to a device that needs daily charging. If you are an avid outdoorsman you will also need a long battery life especially if your power storage options are limited. People who use smartphones know how hard it is to use the device when it is too bright outdoors. In order to read messages or the screen you need to find a shade to see things clearly. The same is true for a fitness watch. You need a watch that has a decent screen size and clarity to make it easy to read even if it’s bright outdoors. Try to find a device that uses OLED screen technology. OLED reflects 100% of the sunlight so that the brighter the sun, the easier it is to read. Not all fitness enthusiasts will need GPS function for their fitness tracker. When you’re working out inside the gym for example, you are more concerned about reps, form or weights instead of your location. However, if you’re a hiker or jogger that likes to explore unknown trails, a GPS will be able to help you find your way home. Fitness watches outfitted with GPS are usually more expensive. However, it is a great feature for hikers and outdoorsmen not only for safety reasons but for navigation too. If you’re an iPhone user, you need a fitness tracker that is compatible with your device. When Apple updates their software, you need to ensure that your device will still be supported. When a device is unsupported, it becomes harder or impossible to sync with an app or to analyze data using the app. Check your iPhone for the software version it is using and check your desired fitness watch. The latter should be supported by the former so that they can work seamlessly. This is another optional feature but is really important if you’re looking to lose weight. Generally speaking, the harder you workout, the faster you lose weight. The intensity of the workout can be measured through your heart rate. The higher the heart rate the more intense the workout. Heart rate monitors in fitness trackers have a sensor to measure your pulse. If this feature is important to you, the sensor has to be sensitive in order to be accurate. iPhones are expensive and some fitness trackers are also expensive. The fitness watch you buy should be able to bring value to your health and workouts. Aside from important features, the watch should also be durable so that you can wear it every day for a long time. Another great way to find a good fitness watch is by reading reviews of real life users. Their experiences are a great way to find out how the device works in real life. Some devices are advertised to work a certain way but are not really up to scratch. Reviews will give you a bird’s eye view of what it’s like to own a product and help you avoid unrealistic expectations. Here are some of the best fitness watches today. Description: The ZOGSST Fitness Tracker Watch is a small device but loaded with features. 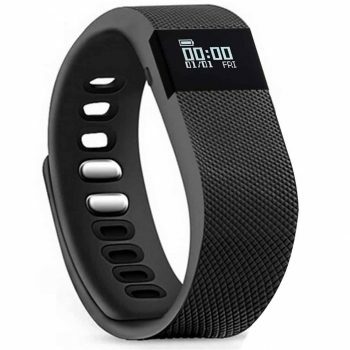 It is a sports tracker pedometer watch that monitors steps, calories burned and distance. It keeps you connected even when you’re working out with incoming calls, messages an notifications from social media. Just tap and slide the screen and you won’t have to miss calls and messages. You can even share your data online to family and friends to help keep you motivated or to monitor your progress. This product also features an IP67 waterproof rating so you can confidently workout even under the rain. It has a decent 5-day battery life with USB charging that you can plug directly to your laptop. Access the VeryFit for Heart Software to analyze data or access valuable information regarding your health. The ZOGSST tracking watch is a great all-around product that can give you valuable health and workout related information at an affordable price. The OLED screen is small but readable in bright sunlight and the device is easy to use and is compatible with iOS 7.1 or above software. Related: Listen to your favorite tunes with the Merdumia Wireless Bluetooth Headphones. It has noise cancelling features and a mic so that you can answer calls while working out or hiking. Description: Get high quality craftsmanship with the Willful SW018 Bluetooth Smartwatch. It has an IP68 waterproof rating so you can wear it while washing hands, in the shower or in the pool. The watch is designed to be durable with scratch-resistant HD screen, ergonomic profile, aircraft grade aluminum bezel with metal coating and interchangeable wristbands. This is a great watch for people on the go since a single charge can last up to a week with a charging time of approximately 2 hours. The SW018 also features Bluetooth technology so you can make calls and check SMS while working out. The watch also supports fitness with the heart rate monitor, pedometer, sleep monitor, sedentary and drink functions. Other features include sedentary and drink reminder so that you don’t stay stationary and stay hydrated all day long. It also lets you check app messages via Bluetooth and remote control your phone’s camera and music. It is a great and more affordable alternative to branded smartwatches like the Fitbit and Apple Watch. Related: Charge all your devices in one charging station with the FlePow 5-Port Detachable Universal USB Charging Station. Save time and space when charging your iPhone, SW018, tablet and other devices. Description: The Teslasz Bluetooth Fitness Tracker might be on the affordable side but it is loaded with lots of fitness features. This affordable fitness watch features Bluetooth support, clock, pedometer, calorie counter, distance, sleep monitor and call reminder. It is sturdily designed so that it can support you during workout and many outdoor activities like hiking and walking. The sleep monitor helps you to analyze the quality of your sleep not only to help fight fatigue but also to help improve your quality of life. For data analysis, download the Very Fit 2.0 app and you will be able to monitor daily fitness like exercises and daily Steps to reach desired number of daily steps to help improve your health. This watch is very affordable and is a great “starter” fitness watch for beginners. It is designed to be durable so that you can wear it every day doing various activities. This also makes a good watch for children to measure their daily activities or just for monitoring time. Overall, it offers great value for the money and is easy to synch to your iPhone and to use. Related: Leave a charger at home and another one inside your bag, at the gym or office with the Teslasz Charger Cable. An extra charger ensures that you don’t run out of juice at a crucial moment. Description: The EFOSHM Fitness Tracker Watch looks simple and is affordable but has all the bells and whistles of an expensive fitness watch. It has a sedentary reminder that beeps to remind you to move if you’ve been sitting or stationary for too long. It has a gesture control so that you can access information without pressing anything. It even has a pedometer that tells you the number of steps you’ve taken and the distance you’ve covered during a run. The screen detaches to the band and so you can plug it directly to a USB port for cordless charging. It has a battery life of approximately 3-4 days but the battery meter is always visible so you can monitor the charge easily. 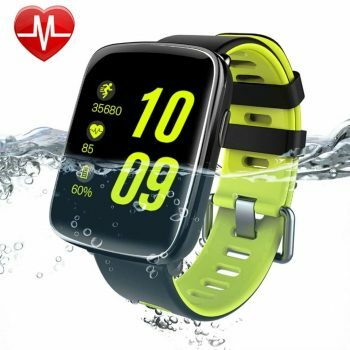 This is a great watch to own if you want to lose weight because aside from the pedometer it also measures calories consumption and calories burned so that you can reach your ideal weight easily. The watch does have some issues that make it a bit buggy. Common issues include: inaccurate number of steps (manufacturers suggest swinging of hands for more accurate monitoring) and buggy synch with iPhone app. Manufacturers recommend uninstalling then installing the app to make it work. Related: Stay hydrated while hiking or walking with the Nalgene Tritan Water Bottle. It is BPA-free and is impact, odor and stain-resistant. 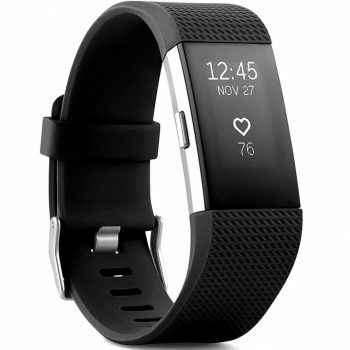 Description: Get a better understanding of your fitness level with the Fitbit Charge 2 Wristband. See how you can improve over time using the personalized Cardio Fitness Score. Use GPS during run mode to see real-time stats like pace and distance right on your wrist. Maximize your workouts using simplified heart rate zones (fat burn, cardio and peak). It also features PurePulse continuous, automatic wrist-based heart rate tracking to better measure calorie burn all day. See the whole picture using the Fitbit app. Synch automatically and wirelessly with your iPhone to accesses and analyze information in steps, exercise, workouts, weight and heart rate. With the FitBit Charge you can monitor daily activities like sleep, SmartTrack (auto exercise recognition) and sedentary alarm. You can also buy interchangeable bands so you can transform your Charge 2 from workout to work. 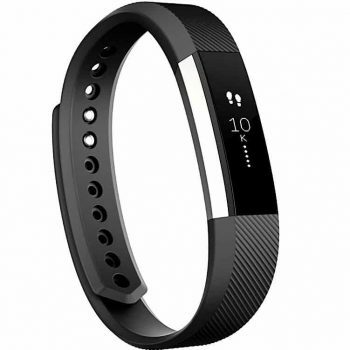 The Fitbit Charge uses an OLED screen that helps you stay connected with call, text and calendar alerts, stay active with Reminders to Move, and find moments of calm with guided breathing sessions. This fitness watch is a bit expensive but features advanced technology in a sleeker and modern looking package so that you will be motivated to move faster and push yourself further. Related: Change the look of your Fitbit Charge easily with the Bayite For Fitbit Charge 2 Stainless Steel Bands. This band will make your device transition from the gym to the boardroom in seconds. Description: The Wesoo K1 Fitness Watch is your private health assistant. Track your workouts, steps, distance, calories and activity time. As well as monitor your sleep quality metrics including time, deep and light sleep. Your health assistant now is on your wrist. It features all-new hardware architecture enables faster processing and more accurate workout data so you have the right information at all times. Stay stationary or sit around for long and you will receive a sedentary alert to remind you to keep on moving. Never miss a call with the incoming call notification. The K1 also features a Built-in USB for easier cord-free charging. 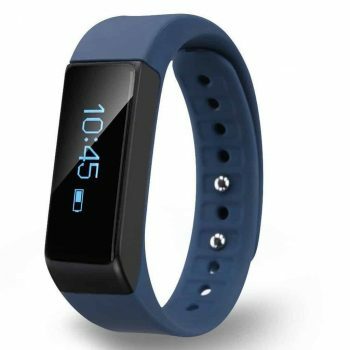 This device is ultra-thin and super lightweight with removable wrist band that allows you to choose multiple color selections, to be different and colorful every day. The K1 is a great fitness tracker with IPX7 waterproof rating so you can wear the bracelet in rainy and stormy weather. The device is compatible with iPhones with iOS 9 or above software and a decent battery life of around 1 week. Related: Stay visible while walking or trekking in the dark with the GlowONme Reflective Vest. This vest is wearable for all seasons with 360-degree visibility for cycling, jogging, walking and outdoor sport use. 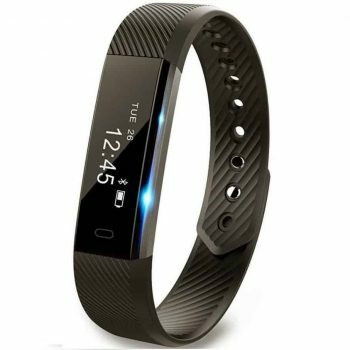 Description: The NewYouDirect Activity Tracker is a high quality smart wearable health assistant. This product features a pedometer, timer, distance, calorie counter and sleep monitor. But that’s not all because the .086-inch OLED display helps you access SMS, call reminder, anti-lost vibrate, sedentary vibrate, alarm clock, sports target setting and camera remote control. The device can be used as a stand-alone fitness tracker or synch it with the VeryFit app to access and analyze your workout and health data. It also has a sedentary and drink reminder so that you don’t forget to move or stay hydrated throughout the day. The device has a built-in USB for easy charging on your PC, laptop or power bank. Change the look of your fitness watch with interchangeable colorful bands to suit your mood. It also has a WristSense feature so the screen lights up for easy data access when you raise your wrist. The bright LED tap display enables you to see your daily activity and the time. Related: Run or walk more comfortably with the ASICS Men’s Gel-Venture 6 Running-Shoes. The Gel Cushioning Systems helps to alleviate shock during impact for a smooth transition to midstance. 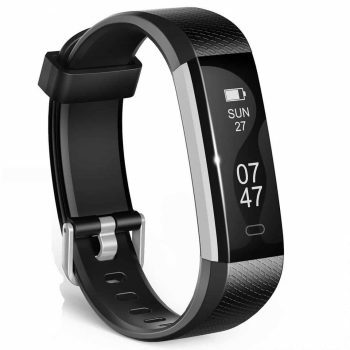 Description: The Fitbit Alta HR Wristband features Fitbit’s slimmest design to date. However, don’t let the slimness fool you because it has PurePulse heart rate for easy heart rate monitoring, auto-sleep tracking with sleep stages, call and text calendar alert, sedentary reminder, pedometer, calories burned, clock and tap to display features. The heart rate monitor in the Alta HR will make it easier for users to track their heart rate the whole day and during workouts so that you will have a more accurate reading of your calories burned. Use the Heart Zone feature to see how hard you are working out during exercise so you can increase or decrease the intensity of your workout. Synch wirelessly to the Fitbit app to access and analyze your workout data so that you have a better understanding of your workout needs and health requirements. This device tracks everything from calories to steps and even your sleep cycle. The device uses your heart rate to show time in light, deep and REM sleep to help you understand your sleep quality. This is a great device for people who are looking for a fitness tracker with a very good heart rate monitor. Related: Protect your Alta HR from nicks and scratches with the IQShield Fitbit Alta HR Screen Protector. It features 4 layers of protection for durability and friction-less smooth touch. And that concludes our review section. Fitness trackers promise users that they will help keep them active. Seamlessly pairing them with an iPhone makes it easier for users to monitor their progress or analyze their data by using information such as sleep quality, calorie consumed and heart rate. A good fitness watch should be comfortable enough to wear all day with decent battery life so you don’t need to keep charging the device. Aside from the above mentioned fitness watches, iPhone users can also take advantage of the Apple Watch as it offers the deepest integration with your smartphone. If you’re in the market for a new fitness tracker, remember to buy a device that suits your lifestyle. It should also be durable enough to withstand your workouts for good value. However, a fitness tracker is only part of the deal. You also have to keep moving and keep exercising so you can reach your fitness goals. Do you think a fitness watch will help you reach your fitness goals? What do you think of the products featured? Tell us by leaving your comments below.